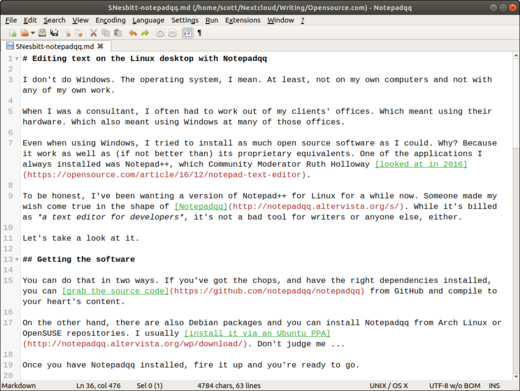 Learn about Notepadqq, a Linux text editor that mimics Notepad++. I don't do Windows. The operating system, I mean. At least, not on my own computers and not with any of my own work. When I was a consultant, I often had to work out of my clients' offices, which meant using their hardware, which also meant using Windows at many of those offices. To be honest, I've wanted a version of Notepad++ for Linux for a while now. Someone made my wish come true in the shape of Notepadqq. Although it's billed as "a text editor for developers," it's not a bad tool for writers or anyone else, either. You can get Notepadqq in two ways. If you've got the chops and have the right dependencies installed, you can grab the source code from GitHub and compile to your heart's content. Once you have Notepadqq installed, fire it up and you're ready to go. I'm going to describe how I use Notepadqq to complete the jobs I need to complete—like writing, cobbling together simple shell scripts, editing web pages, and the like. I don't code, so I can't tell you how good (or not) Notepadqq is for that job. You have been warned. You're probably thinking that writing with a text editor involves just firing it up and typing. Well, you're right. Kind of. I'm not always writing in plain, vanilla text. I also work with a number of markup languages including Markdown, HTML, and LaTeX. For that, Notepadqq does a solid job. Editing this article with Notepadqq. Compared to many popular text editors, Notepadqq's set of features seems a bit thin. You can, obviously, open any text file with the editor. While it doesn't do tag matching or auto completion, Notepadqq does have a smart-indent feature, which remembers the indentation settings of the last line I type. Syntax highlighting in a LaTeX document. Notepadqq also has a couple of other useful features for editing text. The first is the ability to convert between upper and lower case. I don't use that a lot, but it comes in quite handy when I need it. I'm hoping the developers add a feature to convert text to title case. Much more useful, and something I use more often, is the feature for trimming spaces from the beginning or end of lines. I use it a lot when dealing with older text files, ones from those other operating systems, or with files that have been converted between markup languages. It saves a lot of boring, repetitive, manual work. On the other hand, there's no word count (although Notepadqq keeps a running character and line count) and no spelling checker. 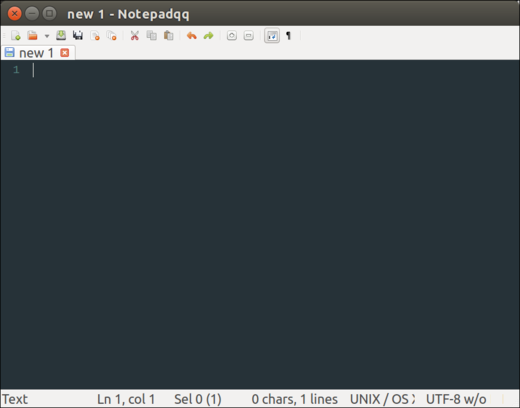 Ultimately, Notepadqq isn't a feature-for-feature Notepad++ clone for Linux. Then again, I don't think it's intended to be. It's still under development, so I'm expecting the folks behind the editor to add a few more features in the coming months. I'd used ++ ten years ago at a job and was sad there was no Linux equivalent. I've since had real good luck with Geany, but may give this one a go. Thanks for sharing it. One of the first things I do with a fresh Linux install is to install Notepad++ in wine. Maybe not ideal for some but running it in wine has worked flawlessly for me since the get-go. Even most of the plugins work as expected.